coastlines reminiscent of the Highland of Scotland, to the lush cloud-filled rainforests around the high peaks both possess. On St. Kitts, you can hike up Mount Liamuiga, travelling through the exotic flora and fauna of the island's rainforest to the mile-wide crater rim of this dormant volcano. Among the vine-laden trees and tropical wildflowers of the misty cloud forest can be found a wide variety of rare and colourful birds and butterflies, as well as the elusive green vervet monkey. On Nevis, you can wander through the cloud forest that encircles the slopes of Nevis Peak, or stride along the windswept eastern coast, learning about the island's diverse ecology and fascinating archaeological history on the way. There are professional guides are available for all sorts of ecological, historical, and archaeological walks and hikes. Kriss Tours (tel. 869-465-4042) and Greg's Safaris (tel. 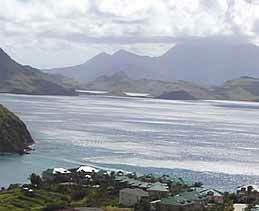 869-465-4121/5209) offer half and full-day tours of the rainforest and, on the full-day tour, of the volcanic rim. 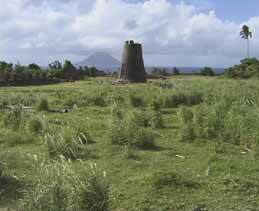 Greg also offers a plantation safari exploring the rich agricultural heritage of St. Kitts. David Rollinson, Eco-Tours Nevis (tel. 869-469-2091 / email: droll@caribsurf.com ). David Rollinson's eco-rambles are wry and informative introductions to the island's diverse botanical species. Jim Johnson, Top to Bottom (tel. 869-469-9080). Jim Johnson provides visitors with an enthusiastic look at the island's birds and plants. Michael Herbert, Herberts Heights (tel. 869-469-2501). Michael Herbert offers a half-hour hike to Herbert's Heights, a gentle, sloping hillside, 1200 feet above sea level that has the same panorama of vistas as Nevis Peak, without the steep climb. Linell and Earla Liburd, Sunrise Tours (tel. 869-469-2758).